By buying this product you can collect up to 112 bonuspoints. 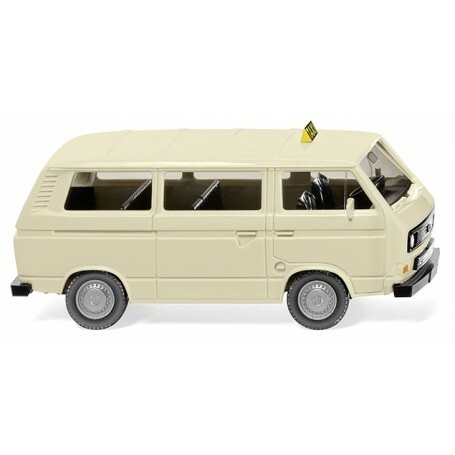 Taxi - VW T3 bus, 1979. Body light ivory, chassis with grille and lower air intake black. Interior also black. Taxi sign signal yellow with black, negative relief 'Taxi' imprint. Wheel rims in silver. Grille with silver-painted VW logo and imprinted traffic orange indicators. Hand-painted headlamps. Tail lights carmine red, with black door lock and silver-painted 'Volkswagen' and 'Bus' lettering on black base surface.